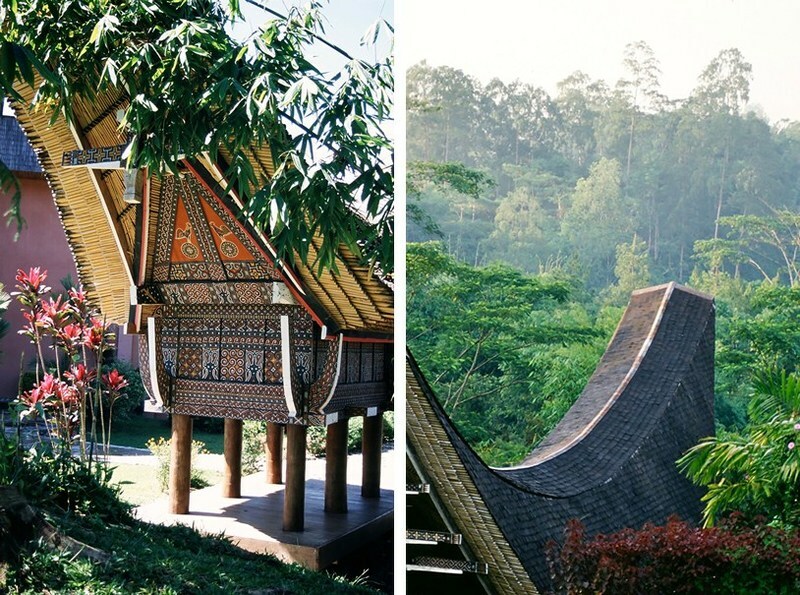 Journeying through Tana Toraja Regency in South Sulawesi, one comes across many extraordinary sights and experiences. The region offers stunning landscapes including lofty mountains, lush highlands and ancient terraced rice fields. Perhaps most interesting of all is its rich and complex culture. 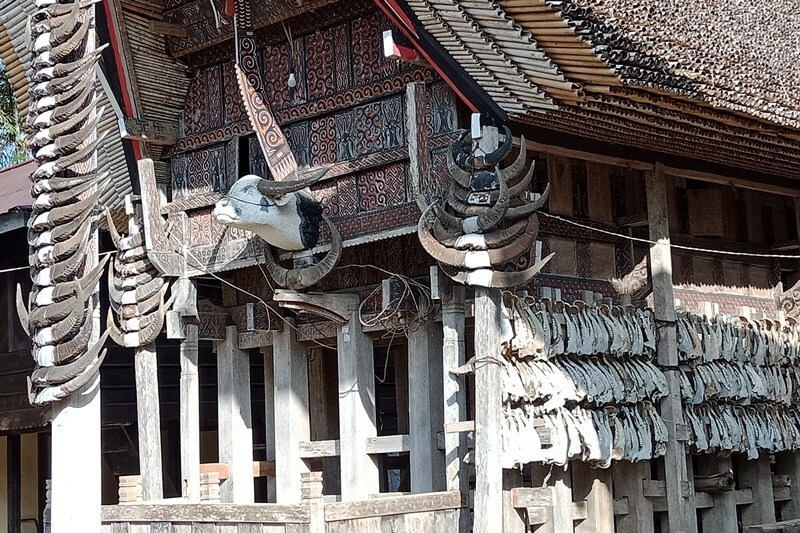 Some of the most unique cultural practices and beliefs in Tana Toraja are their funeral rights and their honouring of the dead. After I entered the darkened lounge of a traditional Tongkonan house, my guide Sada, gestured to me to take a seat, and I found myself sitting next to a five-year-old mummified grandmother. Trying to appear as relaxed as possible, I looked around. The wooden panels of the lounge were beautifully carved with colourful motifs and the building had an elegant high peaked ceiling. Sada—my guide with over thirty years of local guiding experience—seeing my discomfort, quickly assured me that all was well with my new companion. “Grandma, whose husband passed on before her, will be given her funeral rites when the family, who own this house, have saved up to pay for a second funeral. Notice there is no smell at all,” he said enthusiastically. “The Torajan people have been preserving bodies for centuries. They know how to do this by covering bodies in a mixture of bark from a kadinge tree, young areca fruit, roasted coffee and cuava leaf”. It was a serene, somewhat surreal experience to sit with grandma. After a couple of minutes, however, I said my polite farewells. I left through an arched doorway decorated with many buffalo horns, which Sada explained were from past sacrifices. As we walked through the village, Sada told me that some preserved bodies are stored in ornately decorated sarcophaguses. For men of royal descent, the widow is obliged to stay in the same room as her dead spouse until the funeral ceremony and final burial and symbolically rot with her husband. “As the mummified corpse gradually disintegrates, every day a bowl of food is placed before the royal family member. Also, palm wine is poured daily. An offering of betel nut or chewing tobacco is made at regular intervals and the special diet must exclude rice products. It is important to nourish the deceased’s soul as he physically rots away and dies during this time and his tending wife stays with him. The Torajan people believe it is only through this particular ritual that a male royal family member will become a free soul. It will also ensure a more abundant next life. 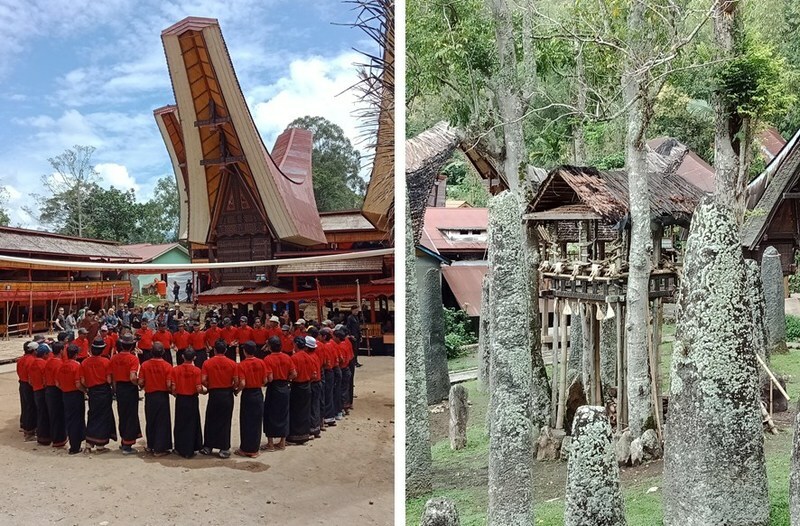 One of the highlights of visiting Toraja is attending a traditional funeral, which is held only when a family has saved up enough money to host the elaborate event. It is necessary to build a complete village to house hundreds of guests and extended family who come from far and wide, over the five-day period. The temporary village is later dismantled. A Torajan funeral is a send-off”, Sada explained. “It is a celebration of the soul, so grieving and quiet tones are not appropriate”. Another significant cost is purchasing animals for ritual sacrifice. Sada informed me that it was not uncommon to have over 50 pigs and several buffaloes sacrificed at a funeral. Since the going rate for a buffalo starts at USD 2,500 and goes up to 40,000 (for a large pink prized buffalo) and pigs go for USD250 to 350, a funeral is a very costly affair. I could easily understand why mummified bodies, like grandma, ended up staying in the family house for several years. At Sada’s invitation, I walked along a one-kilometer dusty trail near a village, north of Rantepao, the main cultural centre in Tana Toraja, to a temporary bamboo village. The temperature had already hit 35 degrees by 10 am. I joined a stream of local people making their way to the funeral. I was surprised by the casual chatting and happy atmosphere. “A Torajan funeral is a send-off”, Sada explained. “It is a celebration of the soul, so grieving and quiet tones are not appropriate”. On arrival at the funeral, I was immediately greeted by some family members of the deceased and invited to sit with them at the family platform. Within a few minutes, tea and snacks arrived. I met people from Jakarta, East Java, Sumatra and as far away as East Timor. I felt so honoured to sit with the family and Sada explained to me that if foreigners come to a torajan funeral, it is seen as a sign of good luck, and they are treated as dignitaries and honoured guests. Torajan funerals are not for the faint-hearted, and the next part of the ceremony involved the animal sacrifice. It was a bit of a messy and bloody affair as a multitude of pigs and buffaloes being hauled into the ‘circle of sacrifice’. Amid cries of distress from the animals, they were mercifully dispatched with high speed and efficiency. Shortly after this, huge chunks of meat were weighed and divided systematically among the local people according to their rank and status. I found out that my hosts had to offer a certain number of pigs or buffaloes to guests, depending on which of four classes the guests belonged to, from peasant class to nobility. Chanting and dancing are also an essential part of torajan funeral ceremonies. These activities are seen as supporting the deceased on the long journey to the afterlife. I was therefore pleased to see part of the Ma’badong, a key ritual in every funeral. A large group of men dressed in black formed a circle and began to slowly move their arms and chant. Sada informed me that this would continue throughout the night. The Ma’randing warrior dance, performed by several men is another part of the funeral ritual. It signifies the courage of the deceased during their life on earth. The men wield swords, sport beautiful headdresses and buffalo horn helmets and hold large buffalo skin shields. The dance takes place before the ceremonial procession, which involves carrying the body of the deceased from the rice barn to the site of the funeral. The dancing is then then turned over to the older women who dress in long feathered costumes and perform the Ma’katia, a poetic song which speaks of the generosity and loyalty of the deceased person. Next on the agenda was a visit to Toraja’s death cliffs, another fascinating aspect of the culture. The Torajans bury their dead in coffin slots chiselled in cliffs, hillsides or rocks. Some have effigies placed in front of the rock entrances to guard the spirit of the dead body. Some bodies are left out in the open, over time exposing the skeleton to the elements. Many of these bones are over 400 years old. Torajan culture dates back to ancient times and encompasses many aspect of life, beyond death rites and practices. 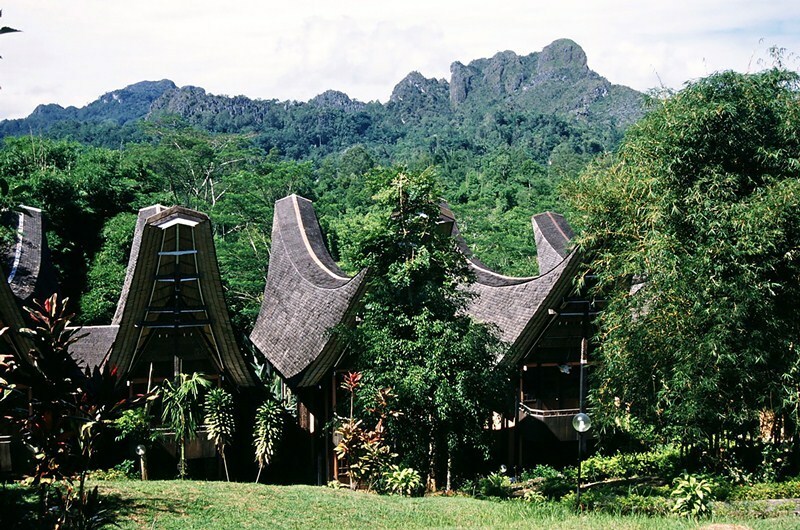 Toraja’s belief system is called Aluk Tolodo, which translates to ‘the way’ or ‘the law’. It holds the belief that there is an upper world, heaven, and the celestial, starship-shaped Tongkonan rooves represent this. There is also an underworld, earth, which belongs to man. In “Ring of Fire, An Indonesian Odyssey”, authors Lawrence and Lorne Blair asked the Torajan people themselves where they came from and their reply was, “Before the dawn of human memory our ancestors descended from the Pleiades in sky ships and the shape of our Torajan houses resemble these very skyships that brought us from the heavens to earth”. Travelling through the countryside, I tried to learn as much as I could about the Torajan people. With Sada’s help, I chatted with many mountain folk and we would stop at little wooden makeshift coffee huts that are dotted along the small roads. Early in the morning, I would love to greet the school children sharing the road with farmers and villagers. I discovered that it was not unusual for the children to walk eight to twelve kilometres to and from school each day! Sitting around in the evening I talked into the night with Sada, who told me about the social system in Toraja, for example explaining the bilateral family system. “A family line is maintained so that each person belongs to both the mother’s and the father’s family. It is the only system of its kind in Indonesia. Children inherit the family land and house from both the mother and the father”, he said. He then chuckled as he added, “And the family debts”. Sada continued, “Try and time your next visit to take in a Torajan festival. We have dances for every occasion, ranging from war to harvesting. I will let you know when we have the next Ma’bua. This dance, involves a priest who wears a buffalo head and dances around a sacred tree, and only takes place every 12 years”. From cemeteries to ceremonies, a delightful experience awaits the traveller who takes the time to go to Tana Toraja and learn a little of its vibrant culture – a timeless and beautiful land steeped in a truly unique tradition. 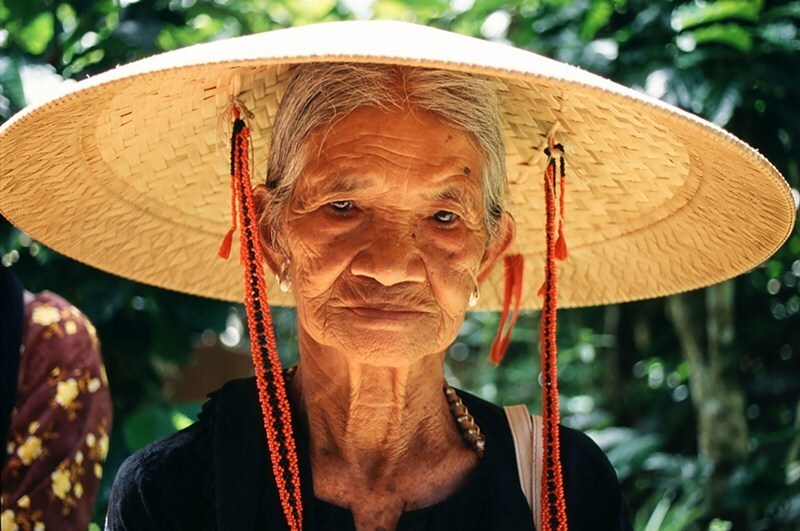 David Metcalf runs photo workshops in Bali and cultural photography tours in Bali, Borneo, Vietnam, Odisha India and Myanmar.